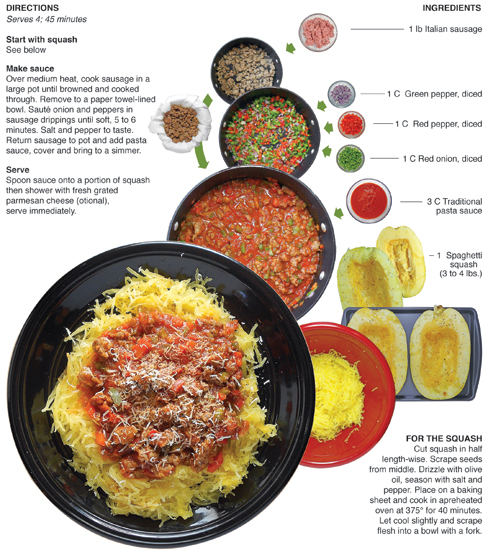 Spaghetti Squash with Special Sauce! Squash has been dated as far back as 7,000 B.C. in parts of Mexico and South America. According to The Oxford Companion to American Food and Drink, explorers from Europe originally thought squash were melons and were delighted to find them everywhere they went in the new world. 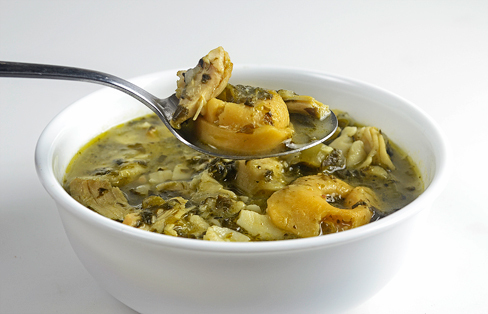 Squash is one of many examples of a modern food staple discovered in the Americas. I'm starting to think that the diet of most Europeans before they began exploring consisted of grass, tree bark and the flesh of what ever animal they weren't currently using as transportation. Here I used spaghetti squash, a winter variety, as a substitute for — you guessed it — spaghetti. It's so much lighter than pasta and has a delicate flavor. In fact, I prefer spaghetti squash over actual spaghetti. The sauce is a traditional store bought sauce with some amplifiers. Kind of like a factory car turned into a hot rod. Fresh sausage, onion and green pepper give it a flavor boast that is sure to please. Cut squash in half length-wise. Scrape seeds from middle. Drizzle with olive oil, season with salt and pepper. Place on a baking sheet and cook in apreheated oven at 375° for 40 minutes. Let cool slightly and scrape flesh into a bowl with a fork. I like to have a couple of flavored rice packets in the pantry for a quick bite to eat now and then. If you watch the shelves at the local grocery, you can get these packets on sale for a $1.00 or less. Just a couple weeks ago I purchased 4 packages of the Knorr brand fiesta sides for 89¢ a packet. I can eat most of one of these packets for a lunch and have the rest as a side with dinner the next day. The rice by itself isn't something I crave or would pay more the a buck for, but it does qualify in the fast-cheap-lunch category in my kitchen. 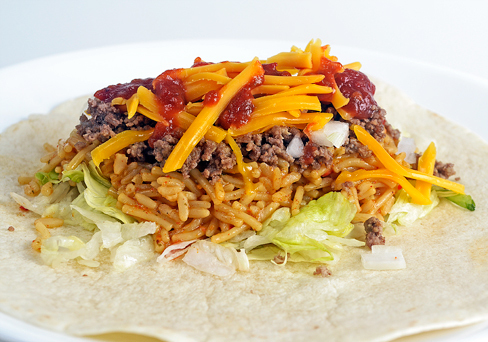 Recently I decided to make a packet of Taco Rice for burritos. I had ground beef, chipotle salsa, lettuce, onion and cheese leftover from tacos the night before and needed the rice to make a meal out of the leftover taco supplies. The Taco Rice really helped fill the burrito out and when combined with the other ingredients made for a better-than-average lunch in the taste department. If I had had the time I would have made my own taco flavored rice, but for lunch on a busy work day — and to get ride of the taco dinner leftovers — this packet provided me with a great meal that filled my belly. That's really all a man can ask for. Prepare rice according package directions. In center of tortilla place 1/2 cup of rice, 1/2 of the ground beef, 2 tablespoons of shredded cheese then garnish with lettuce, onion and salsa. Fold in sides, then roll tortilla shut forming burrito, then serve. Repeat. A couple of weeks ago I attended my cousin's wedding and was treated to the best food I had ever eaten as part of a nuptial celebration. One of the appetizer served was a Crispy Buffalo Chicken Spring Roll with a blue cheese sauce — it was amazing! All week long I had been planning to recreate it. 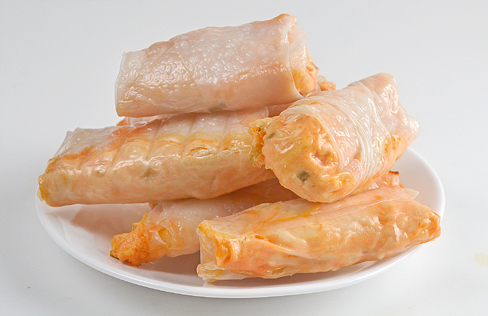 I bought spring roll wrappers, roasted and shredded some chicken breast and had everything ready to go. I prepared them with care. Rolled up the filling in the wraps and placed them in the oven to cook away. The excitement of pulling these delicate treats from the oven and the fantasy of devouring them came crashing to the ground as soon as I opened the oven door. They hadn't crisped up and browned at all. They looked like condom-wrapped cheese plugs. Turns out there was to much moisture with the cream cheese filling I had made. The moisture never let the wrap cook and dry out properly to crisp up. They just turned to rubbery cases for the buffalo chicken filling. I peeled away the wrappers, harvested the filling and made a simple buffalo chicken dip with it. These things happen. Especially when you experiment. Usually the mess-ups aren't this bad though, that's why I had to share it — you really have to be going for it to create a monster like this. I bought a 4 lb package of split chicken and decided to have some fun. The breast was 99¢ per pound so I couldn't resist. First thing I did was to roast it off. A simple salt and pepper was applied and then it was cook at 400° for 45 minutes. Funny thing happened at the end of cooking though. I went to pull the chicken from the oven and the heating element was glowing white in a spot - like a welder. I turned it off immediately, but that small, bright-as-the-sun spot kept burning and moving along the orange-glowing element. As it cooled the spot eventually went out. When it was all said and done (3 or 4 minutes) I realized I had just witnessed my oven fry! I didn't panic becuase it was inside the oven so it was contained. And, Im really glad the chicken was finished cooking before it totally blew. It was Friday evening at 4:30, there was no way I could get that fixed for the weekend — or so I thought. I went to the building management and within an hour a maintenance guy was there with a new element. By 6:30 I was good to go. I was really impressed by how quick it was taken care of. That has been the case with almost everything here at my new place, when I ask for issues to be looked at, they really have been prompt with maintenance. That said - Later that night I shredded and divided the chicken. Half for the spring rolls, and half for a yummy batch of soup. I made this soup because of the cool weather that had rolled in, but also because I wanted to clear out some pantry and freezer space. That's why I choose the tortellini and spinach, it was time to get rid of them - and I must say, they did make for a yummy bowl of soup! In a soup pot over medium heat saute onion, green pepper and celery in a little olive oil until soft, 4 to 6 minutes. Salt and pepper to taste. Add garlic and Italian seasonings, cook until fragrant, 1 to 2 minutes more. Add chicken, tortellini and spinach, bring to a boil. Reduce heat and simmer for 25 to 30 minutes. Portion into bowls and serve. The last weekend of September has become my family's annual "Shindig" at our private campground. It's the big party that allows all of us to show off our new improvements to our beautiful camp sites, all of which feature custom made porches and landscaping. Over the years we have turned it into a little village in the woods. It was started somewhere around 2003 by my Aunt Roxie who had the zany idea of putting a couple of campers in the woods behind her property and starting a camp ground. Most thought it was just a crazy notion, but it stuck. Slowly, a couple of campers turned into a few, a few into a half dozen and so forth. Once people established a spot for themselves, they constructed covered porches to hang out on. If a camper became leaky (They all do if they set in one spot) the porch would be extended to include a roof over the camper. Landscaping and flower gardens appeared. A pavilion and central kitchen, along with a giant meat smoker sprouted up. Custom bars and benches made from live-edge wood planks, harvested from ash trees killed by the ash-borer beetle that populated the campground were installed. It's a constant work in progress. My aunt Roxie left this world in the Spring of 2012, but I guarantee she would be proud of what her zany little critters have done with her crazy idea and be proud of how we've keep improving on it. This year I was asked to make pulled pork for the party. After covering the meat with a homemade spice rub, I used our custom built meat smoker to sear and season the meat with a smoky flavor. I finished the meat in a large roster for more control over the process, and to use citrus to add another layer of flavor as the pork roasted. The meat featured a hint of smoke from the initial cook in the smoker and lots of moisture and sweetness from pineapple and orange juice that it was finished with. The pork and the party were a great success. Start grill and/or smoker. Soak wood chips. Mix together sugar, chili powder, cumin, onion powder and garlic powder. Liberally sprinkle and rub spice mixture all over pork, covering completely. Once grill and/or smoker is ready. Sear meat on all sides. 3 to 4 minutes per side. 15 to 20 minutes total. Remove to indirect heat. Dump wood chips on coals, cover grill or close smoker and let cook for and 2 hours. Remove meat from grill. In one large or two medium roasters, mix together Pork shoulders, onions, orange juice, pineapple chunks and pineapple juice. Cover and slow roast at 200° for 5 to 8 hours, or until meat shreds with a fork and bones can be pulled out with fingers. Pour off 1/2 of the juice. Shred with forks. Stir remaining juice, pineapple chunks, onions and shredded pork together. 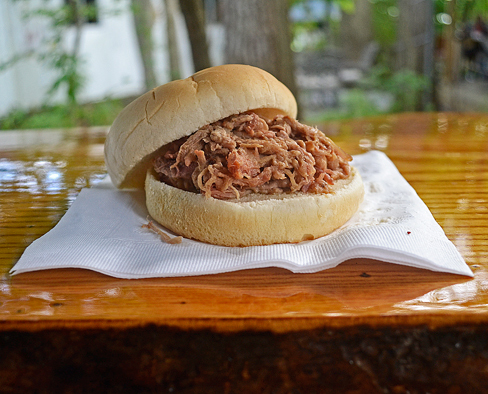 Serve with BBQ sauce and sandwich buns.